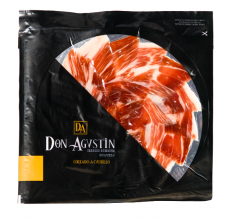 This hand-cut acorn-fed ibérico ham from Don Agustín is a product of the hindquarters of the Ibérico pig, and is characterized by its stylized form, the black hoof and the marbling infiltrating the tissues and contributing to its stunning flavor. The color is red, with pinkish hues. In the mouth, its flavor is intense and prolonged, and unlike anything else on earth. 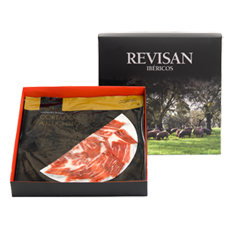 It's a limited production item, and is selected from the finest Ibérico pigs which feed on acorns in wild pastures. Combined with an extremely long and careful cure, this produces a gastronomic jewel - a true treasure of Ibérico hams, and of Spanish gourmet cuisine. 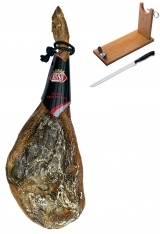 In Spanish, this product is called, "Jamón ibérico de bellota Don Agustín loncheado cortado a mano." Format : Your ham will arrive vacuum packed for freshness in a premium presentation case. Storage : Store your ham in a cool, dark place. 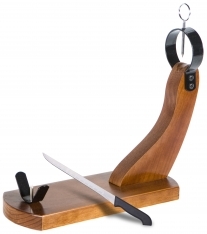 Consumption : You should consume your ham within a year of purchase to enjoy it at its best.